As a performer, teacher, and choreographer, Indira Sreeram Dixith wishes to share her extraordinary joy in dance, striving for new and effective ways to communicate the beauty of Kuchipudi to diverse audiences through new, vibrant, and creative choreography. Indira Sreeram Dixith took up Bharata Natyam at a young age and had her arangetram at the age of 9 under the tutelage of Guru Mythili Kumar. She then continued to learn and specialize in KUCHIPUDI dance style under the Kuchipudi maestro kalaprapoorna Padma Bhushan Dr. Vempati Chinna Satyam. She had more dedicated and professional training under the tutelage of her Guru. She has toured and given performances in almost all the major cities in India, former Soviet Union, Europe, Canada and US. 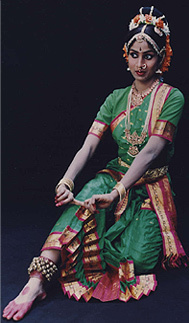 As a member of the elite dance team she has taken part in major festivals of India. She is the artistic founder-director of “Center for Kuchipudi Dance” a kuchipudi dance school established in NJ. Guru Indira Sreeram continues to propagate the ancient art form to the Indian American community in the Tri-state area. Due to her dedicated efforts, Indira Sreeram has not only gained immense recognition as a performer, teacher but also as a choreographer.